Everything in the next section is flavor text only. You may skip right over it, if you´re impatient. "So, how did it go officer? I hope there was no blunder this time!" The chief commander looks rather stern and critical at the small group of men in front of him. "We´ve spent months to get the investigation so far, and it might be our only chance to take out the southern drug syndicate. Did we get what we need?" "Well, yes, sir. I think so, sir. When we blasted through the door we caught Jimmy red-handed with several kilos of the stuff neatly prepared for delivery. And we also caught all the heavy hands of the gang. They will go down for good, sir!" "Jimmy and his gang? What do I care about Jimmy and the gang! We need to get to the bosses behind them. Jimmy is just the little delivery boy. I thought I gave clear instruction to intercept the next big delivery, didn't I?" "Yes... sir, you did. Just..."
"Just that we were a tiny bit too early. See, a delivery was made to Jimmy via the usual routes, and we were positive that it would contain the instructions on the next delivery. So our plan is to grab those papers, take out Jimmy, and lay an ambush at the delivery appointment. That way, no warning could go out, and we catch all the big fish." "Hmm, if you say so. So when is the deal taking place and where?" There is a silent pause of unease before the man answers. "That is part of the problem, Sir. When we blast into the room, Jimmy was just reading the instructions and the first thing he did was trying to destroy everything. We were faster than him, though, and could fixate him before anything was destroyed. Just... "
"Just that it appears the message was somewhat encoded, and Jimmy refused to cooperate. 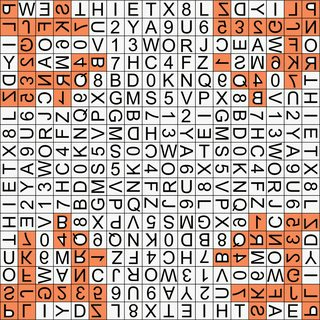 We have all the pieces, but we are still working on the decoding. And, actually, we all hoped that you could be of help here, Sir." 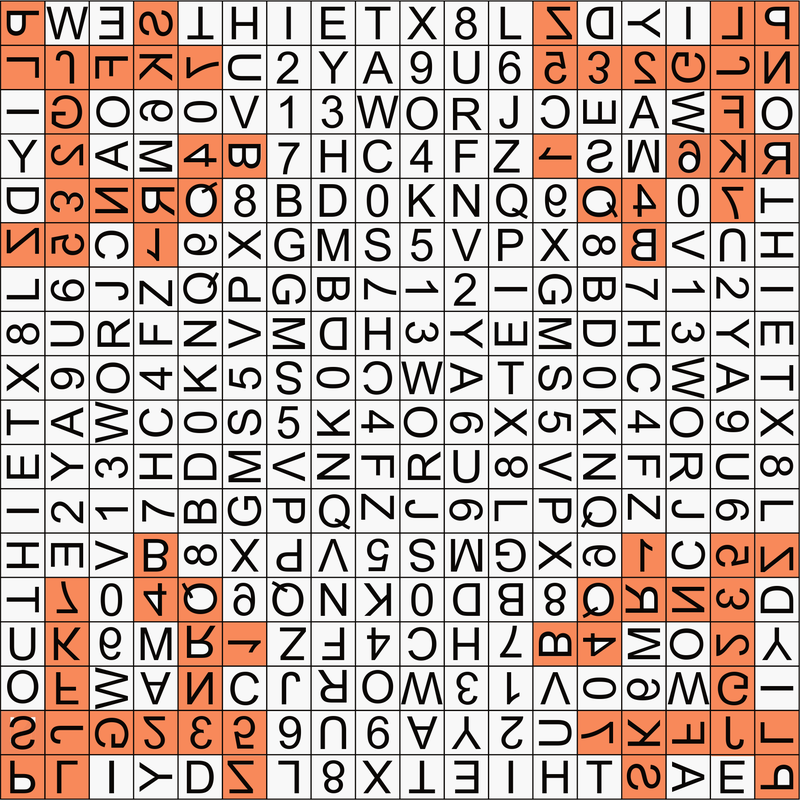 "Code cracking? Just great, thanks. Well, then give me what you have..."
The team took a quick snap shot of the scene where they surprised Jimmy. And somebody spent the time to create a cleaned up, digitized version of the evidence as well. There are two valuable hints in the scene photo. The differnce between circling and ticks is not relevant, though. Thanks to the others here, I managed to figure it out. Sorry about the terrible formatting, I'm pretty new at this. The black arrow in the key, of course, indicates North. 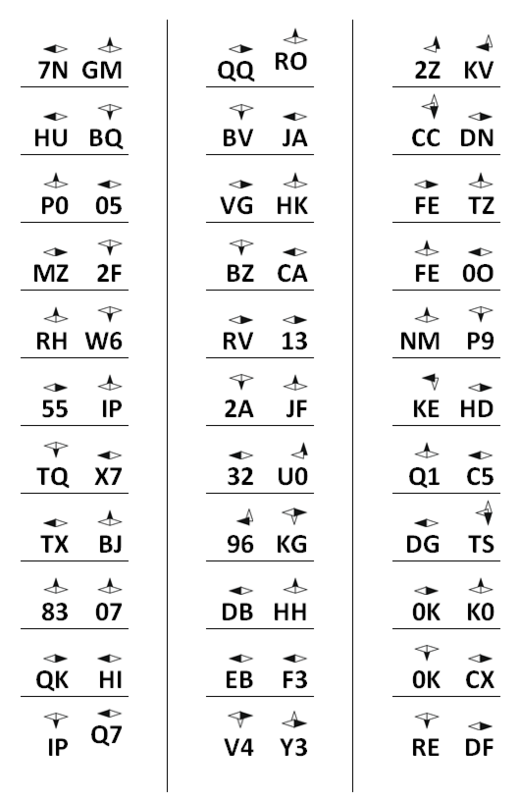 The white arrows indicate the direction of the letters. Toward the end of the second column, the lines started intersecting outside the center area and it didn't make sense. This gave me the idea to project the coordinates onto the center square. This is a bit hard to explain so hopefully this helps clear it up. 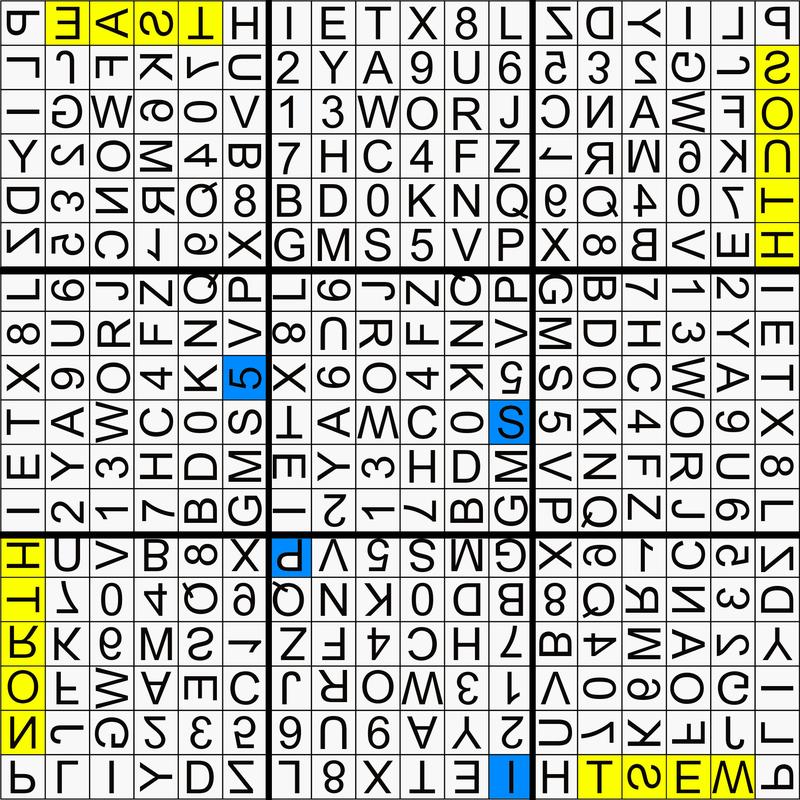 The following image if for the top right item on the clue sheet (2Z, KV). Clarification: The reason this projection works is because the puzzle was meant to be folded into a cube (well, without a rear face). From there you would trace the lines up the side of the cube and use the intersecting lines to get the character. 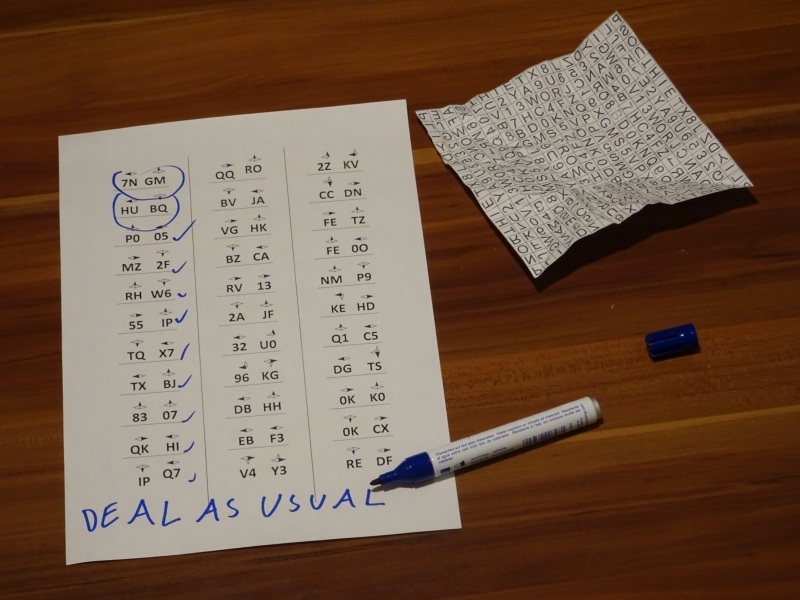 ... "We have done some analysis. 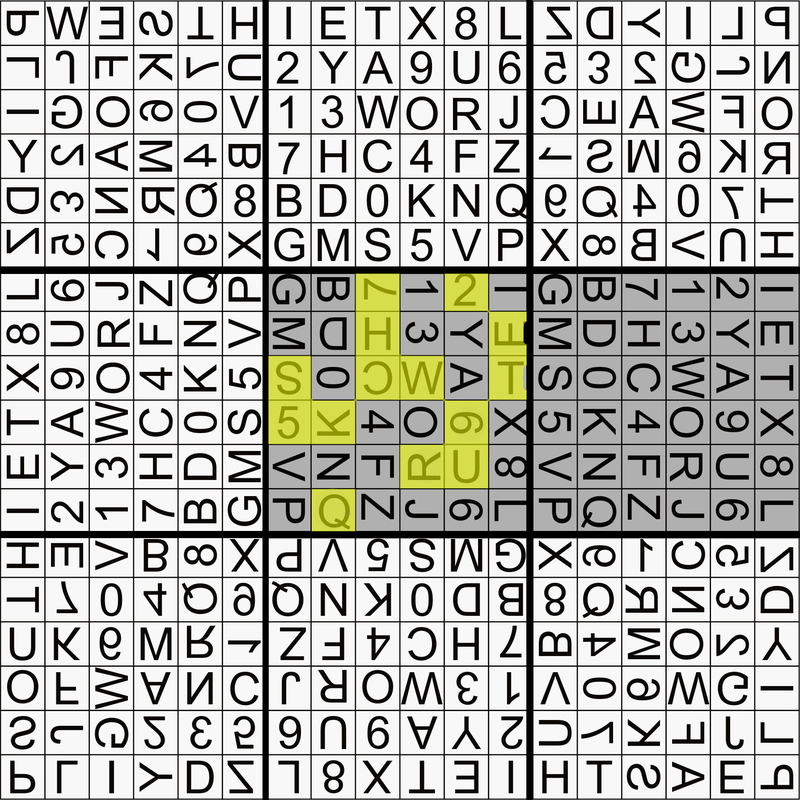 If you split the grid into a larger 3 by 3 grid, every box contains the 36 symbols (A-Z, 0-9). 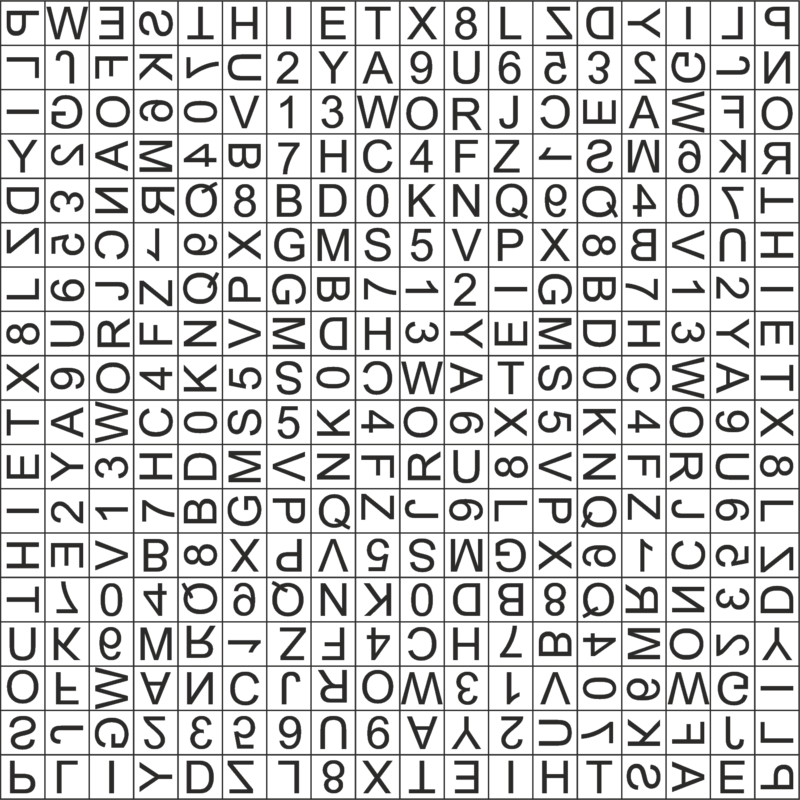 And the side boxes are identical; they're the same combination of letters rotated around the center. Also, the center box is almost the same as the center-right box! Only a few letters have been rotated." "Also, we noticed that only squares in the corners have flipped symbols." 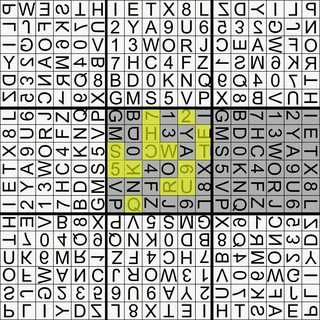 "It seems that each of the four corners contains the word North, East, South and West respectively, just next to the letter P. This is unlikely to be just a random coincidence, so perhaps this has something to do with the orientation of the page?" "How could we miss that! Thanks a million! 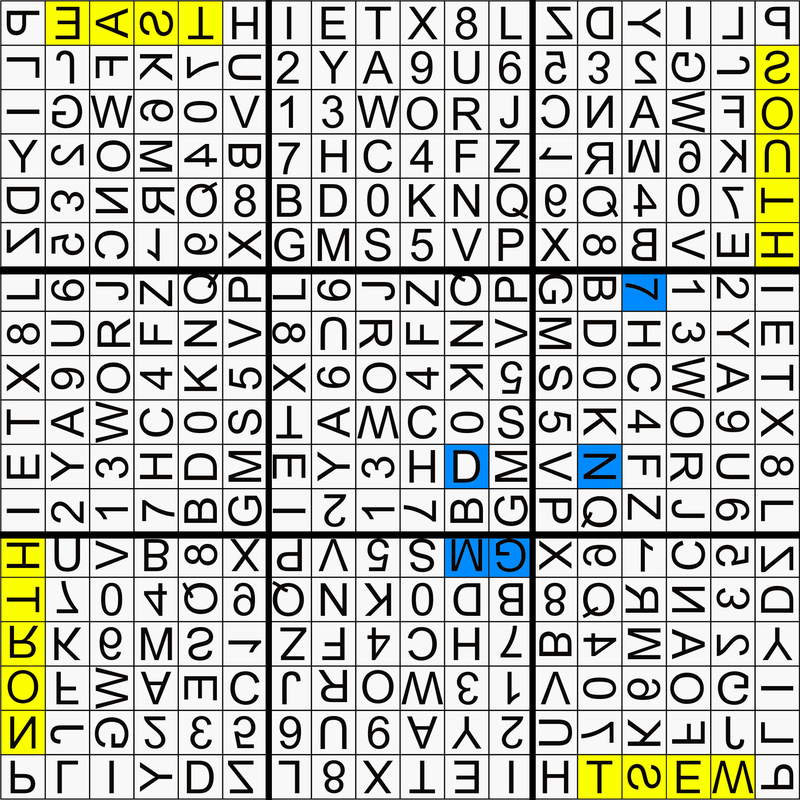 Now, let's highlight the letters in the boxes that match the orientations of the arrows." "What did you do there exactly?" "For every pair of the ciphered letters, we looked at the black arrow above it. Then, we rotated the paper so that the top left corner showed the direction indicated by the arrow. 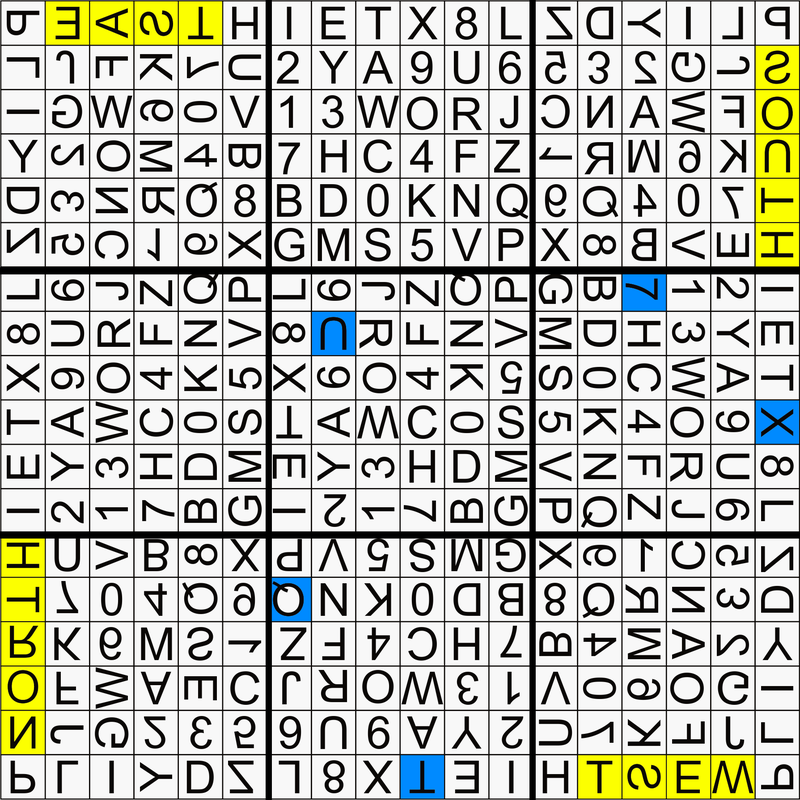 In the top-center 6x6 square, we highlighted the two letters of the cipher-text. 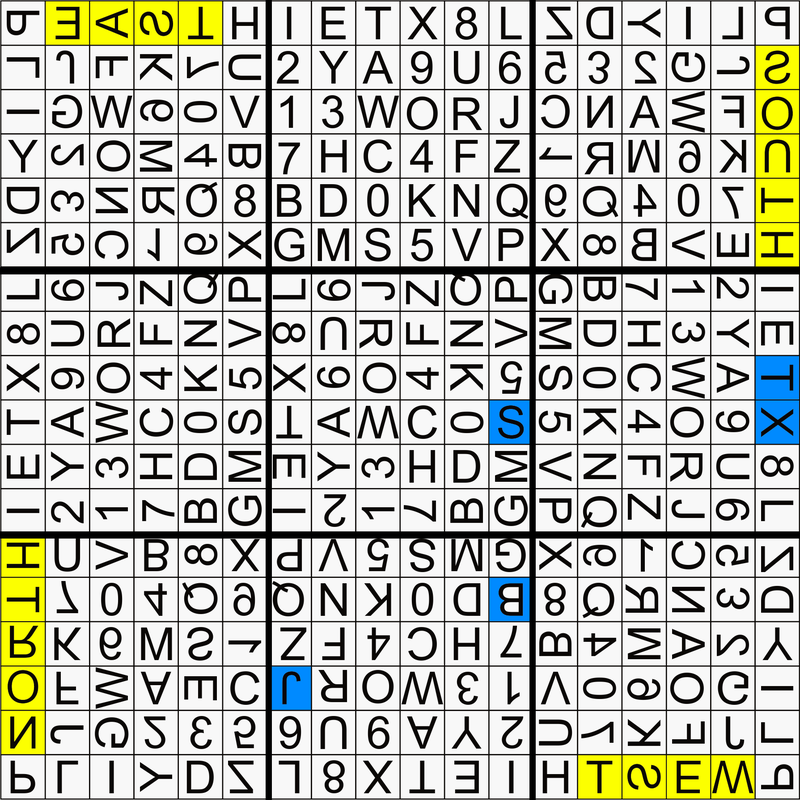 59% of the time, one of these highlighted letters happened to be on the same columns as the decoded letter. There is a correlation; random chance would only make this happen 33% of the time. 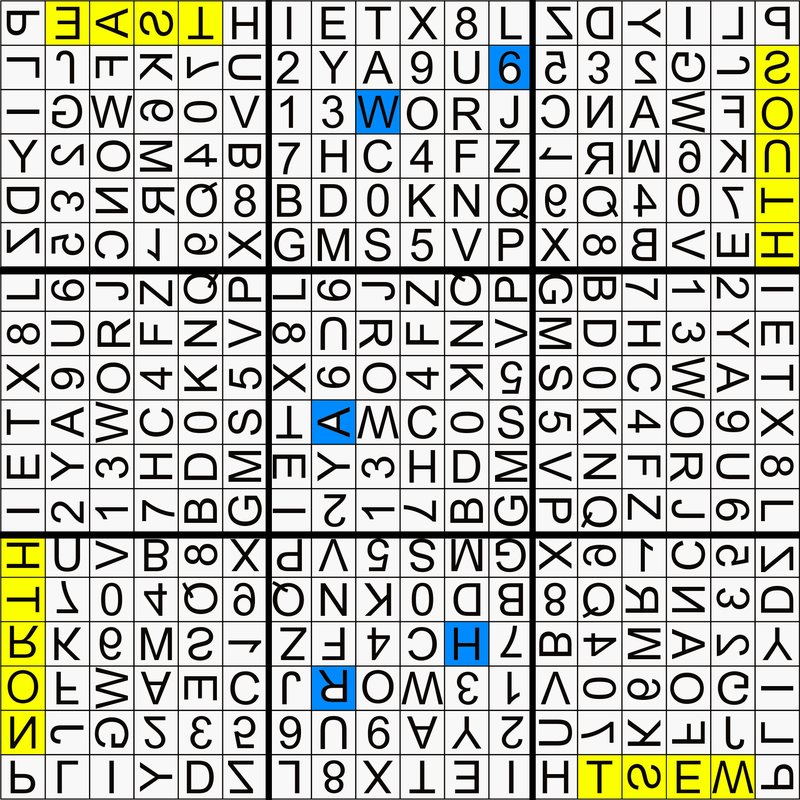 That means that the decryption probably has something to do with matching the columns and rows of the cyphertext." "Why are we still getting 41% of the coordinates wrong? 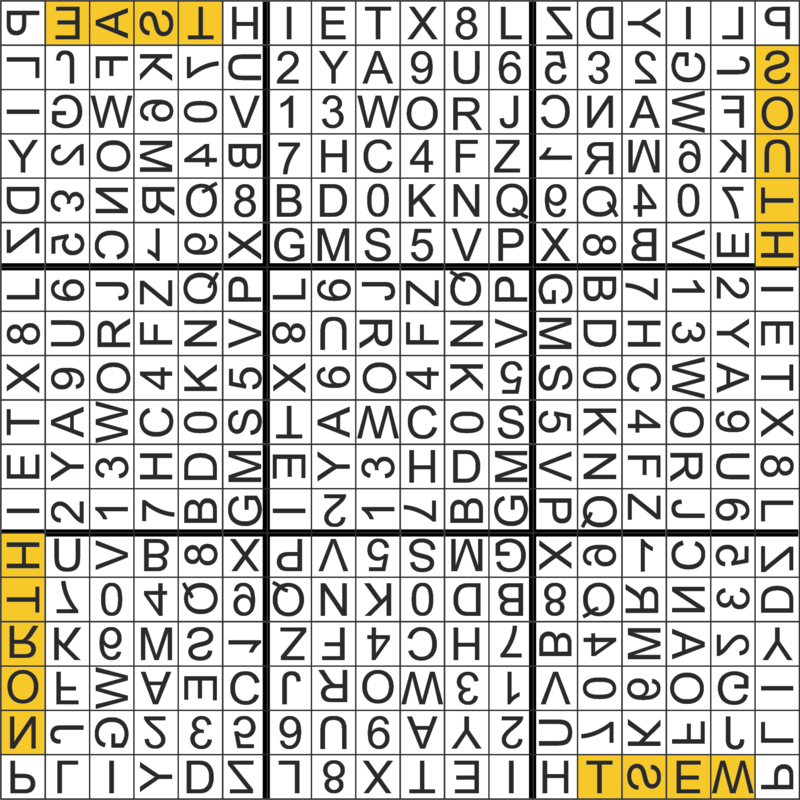 Once we understand the rules correctly, we will be able to decode the message. Now, there is a lot of guessing required." 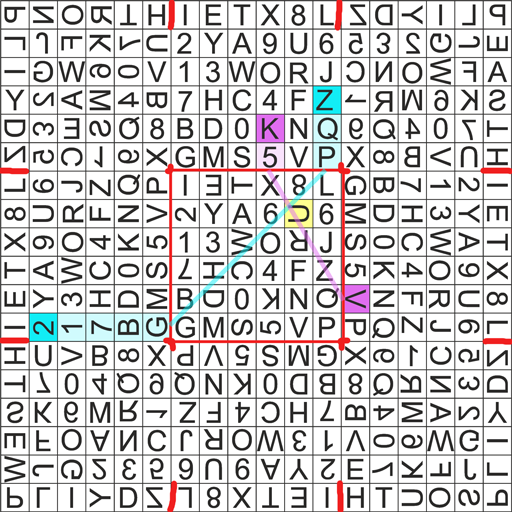 - The grid is symmetrical, with exceptions. 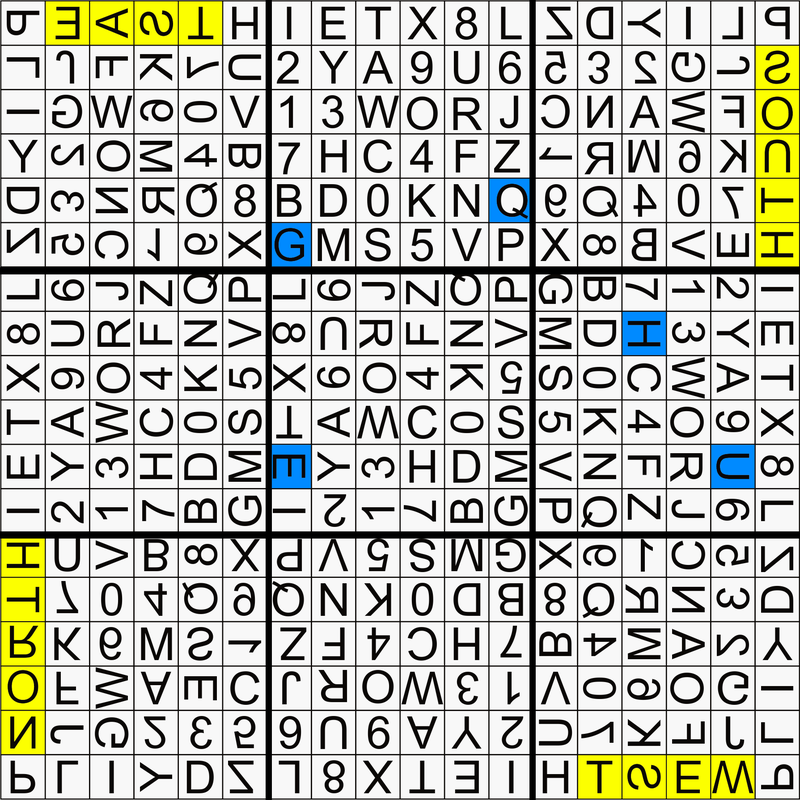 - Divide the grid in 3*3 boxes and every box contains every symbol. 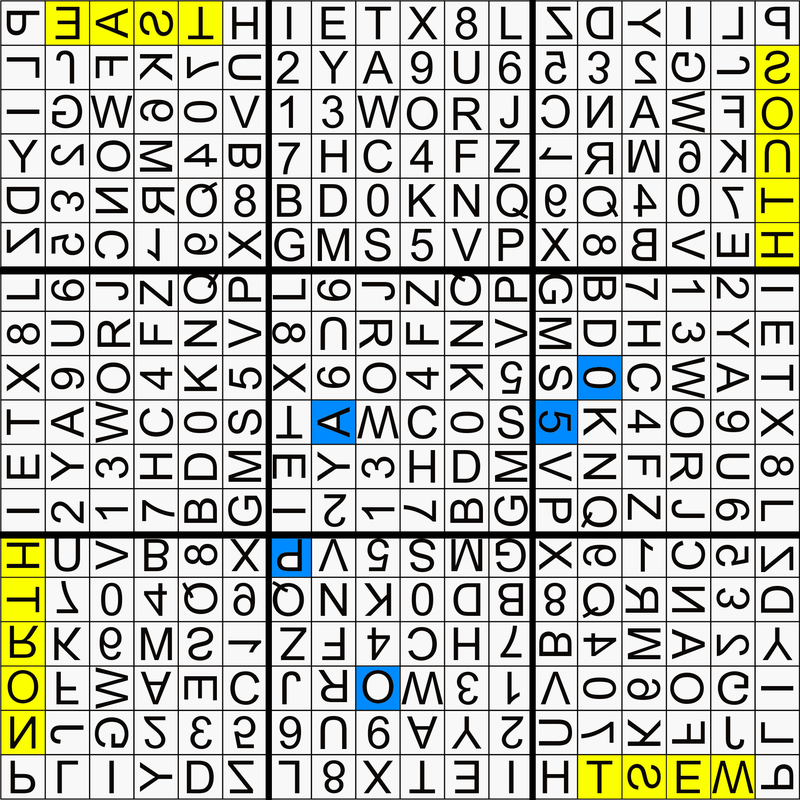 Middle box is the same as the side boxes, but some letters are rotated. - As pointed out by VotBear, every corner has a direction written in it. 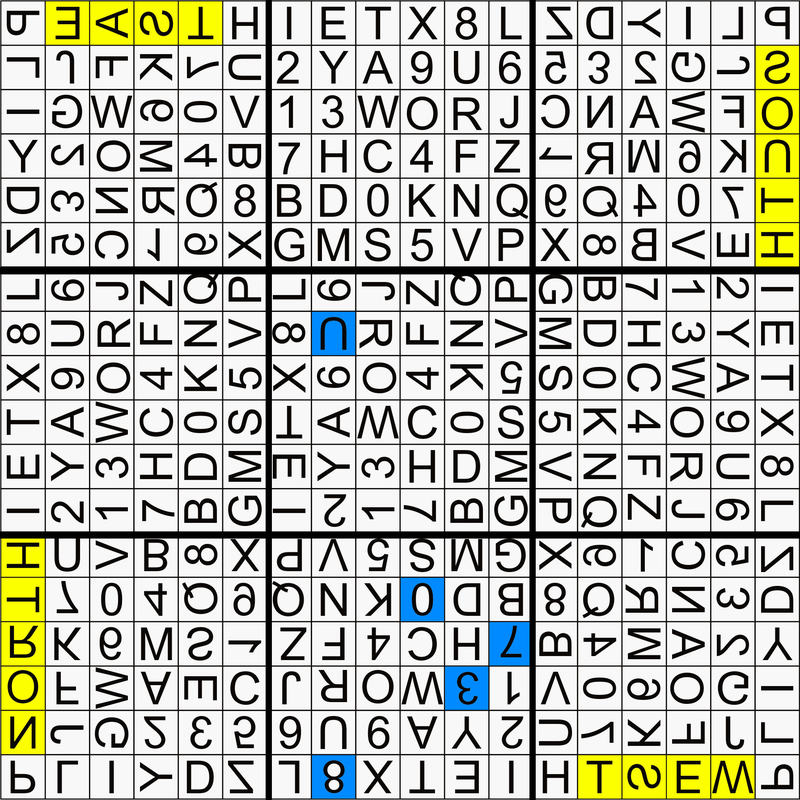 - We can use this to get 59% of the coordinates of the deciphered text right (more than random chance would offer - 33%). The white arrows probably mean something, too, because they're not always the same. I am assuming that the black arrows represent the direction that should be pointed up. But there are other interpretations. For example, they could be the direction a compass would show if the page is oriented correctly (I tried this, it didn't help). Currently, I'm thinking that the row and column of the description letter can somehow be found by rotating the page appropriately and highlighting the cypher-text letters (see above). This makes sense for most of the cyphertext, when the black arrows are at 90° to each other. For others, this wouldn't work (when the arrows are either in the same direction or opposite to each other). Also, this doesn't explain why you need 2 letters for each coordinate. 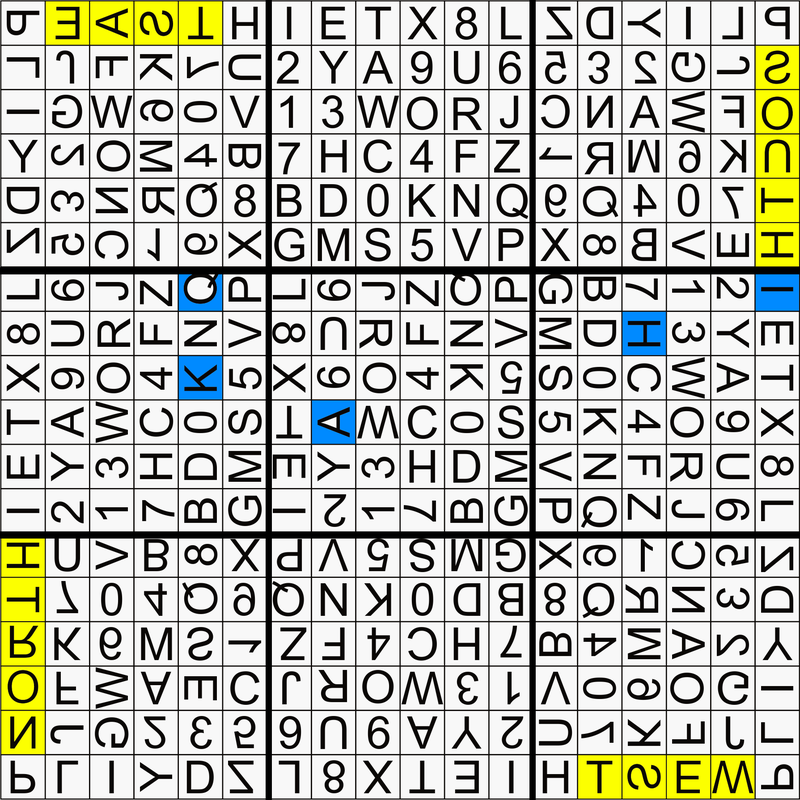 I'm not using the corner 6x6 squares (except for orientations), but they could be a part of the cypher (or not). Thanks to all the hard work done by R.M and VotBear I was able to gain some ground on solving the first column. 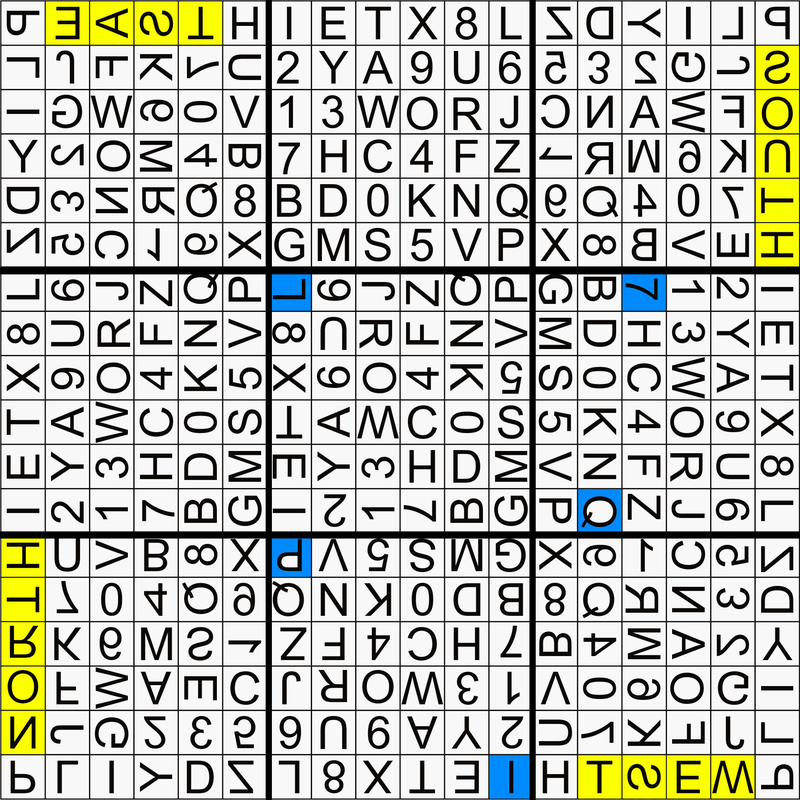 This is just a very partial answer to contribute to the solution, I was not able to solve the next two columns yet. that the black arrow indicates north, I turned the "north side" of the page the same direction the arrow was pointing. So for the 7N coordinate the arrow is pointing left, turn the page so north is on the left hand edge. Next assumption made was the if the arrows are only pointing horizontally I would use the left and right box to mark the coordinates. For the 7N the arrows are horizontal so I drew a line from 7 in the left box to N in the right. If the compass direction has a vertical arrow I would turn the page so north was pointing towards the black arrow and again used the left and right box. GM has a vertical arrow pointing up so I turned the grid to have north facing up and again drew a line between the left and right boxes, G on the left and M on the right. Continuing this pattern spells out "DEAL AS USUAL". Unfortunately I tried the same technique on the following colomn with no success. Off to work will dig deeper later. Not the answer you're looking for? 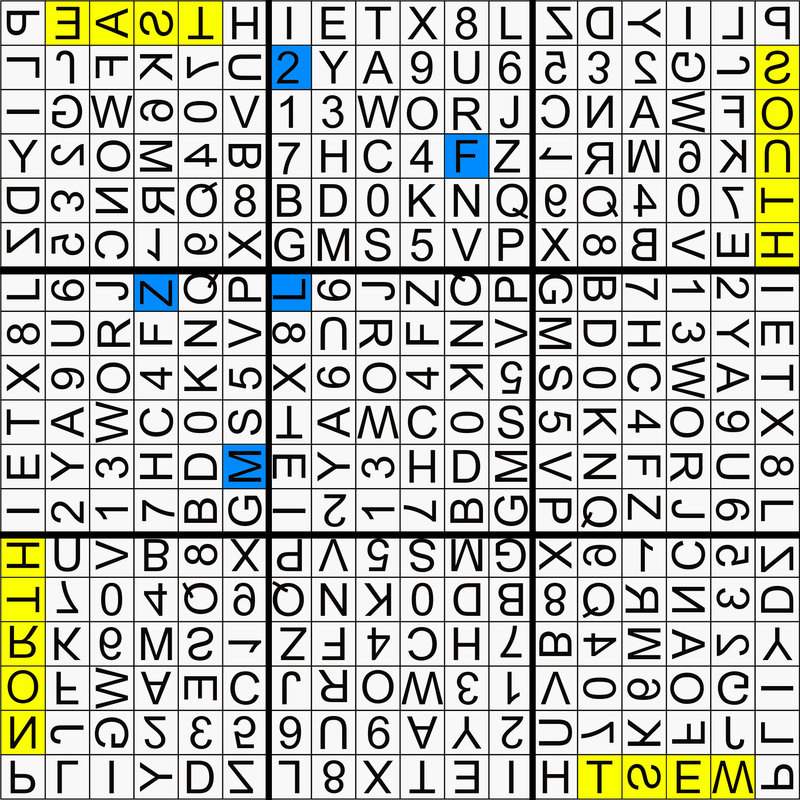 Browse other questions tagged cipher visual cryptography or ask your own question.